If I had to pick a favourite, the grocery store I like best is the Real Canadian Superstore. That's because while Chris and Hannah collect important items such as fruit, vegetables and milk, I spend my time in the Joe Fresh area looking at clothes (usually for me and Hannah), the book area, the toy area and of course, the make-up section. Since we recently purchased our first condo, I'm also perusing the home area and mentally noting all the great items I will soon purchase. It's one stop shopping at its finest. Our home location even has covered parking, which is perfect for Canadian weather. Do you often find yourself aimlessly wandering around the grocery store, forgetting what you’re missing at home? By making a to-buy list you can target exactly what you need, allowing you to get in and get out. And, you can save money by only purchasing necessities! If you visit the same store each week, organize your list by aisles to save you from backtracking. Pick one day a week and designate as your “shopping day”. This way everyone in the family knows to request the items they need before then, which will help you avoid multiple trips to the store. Don’t waste time travelling, going from store to store. Instead, visit a store that meets all your needs – from food, to clothing to baby necessities like Pampers. Visit Loblaws, Atlantic Superstore, Extra Foods, Your Independent Grocer, Zehrs Markets, Valu-mart or Real Canadian Superstore from October 10-23 for the baby event. The event includes exciting offers on all things baby to make shopping even more convenient! Check out the flyer from your participating banners for details! 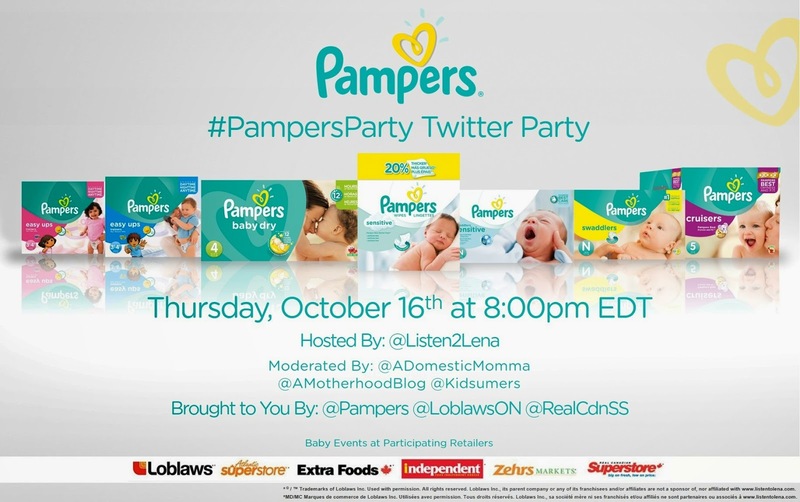 Speaking of Baby, Pampers is having a #PampersParty Twitter Party this evening - Oct. 16th at 8 p.m. EDT. Make sure you RSVP!